If you've heard of Grand Baymen and you're intrigued, then it is worth getting to know more about this incredible community in Belize. To get the inside information, check out the who, what, where, when and why questions that will help you understand what the Grand Baymen has to offer you. The Grand Baymen is a stunning four-story waterfront resort that is currently in construction. From the exterior, you'll fall in love with the colonial British charm with plenty of tropical touches. The interior, however, is completely modern and stocked with all the comforts and amenities you could desire. Complete with kitchens, dining areas, living rooms and central air-conditioning, the condominiums offer residents and guests access to an incredible onsite fitness and pool facility as well as the next-door Exotic Caye Beach Resort. Where is Grand Baymen Located? The Grand Baymen Resort is located in the picture-perfect destination of Ambergris Caye. This island is a popular spot for expats to reside, and it is one of the most scenic spots in the entire country of Belize. Close enough to the mainland for quick travel as well as private enough to let you truly relax, Ambergris Caye is a dream come true for beach bums, culture enthusiasts and just about everyone in between. Why Do People Choose to Invest and Live There? There are countless reasons that individuals from around the world flock to places like the Grand Baymen Resort. Since property rates are more affordable here than in other beachfront destinations, it is possible to own a slice of paradise without paying a fortune. Incredible weather, amazing fresh seafood and a vibrant community of residents contribute to the appeal of the resort and its facilities. 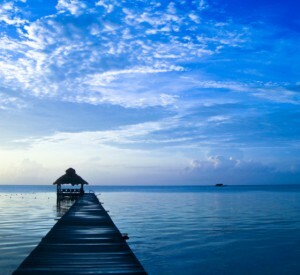 Since Ambergris Caye boasts a tropical climate, you can expect warm temperatures and sunshine whenever you visit. For a great introduction to the property and all its potential, the best time to visit might be during one of the many Chill Weekends organized each year. Spend a long weekend on the island staying in a condo and experiencing what it could be like to call the Grand Baymen Resort your home. You'll spend a few days meeting with sales staff, trying the local cuisine, walking on the beach and soaking up the sun. Who Benefits Most From Buying Property at Grand Baymen? In a word, everyone. Whether you want an affordable place to retire, you are searching for the perfect vacation home for your family or you just want an investment property, the Grand Baymen covers all the bases. However, it is an especially great choice for those who like a laid-back atmosphere, for those who want to invest in waterfront property inexpensively, for those who are ready to own a second home in a tropical location and for anyone who wants a retreat where they can get away from it all while still having access to great neighbors and truly unbeatable amenities. Understanding more about the amazing Grand Baymen Resort on Ambergris Caye, Belize, can help you to decide whether owning a slice of paradise is the right move for you. Find out more about the beautiful Grand Baymen Resort now.